The tropical shores of Siesta Key set a stunning picture from this coastal traditional estate poised on one-and-a-half acres of botanical beauty. Within secluded South Cocoanut Bayou, the four-bedroom home creates warm environments of seaside elegance coupled with spectacular outdoor areas and a lifestyle dedicated to boating and nautical enjoyment. Soaring ceilings, white oak floors, pecky cypress ceiling and wall details, three fireplaces, and a kaleidoscope of natural light create hallmarks of coastal style. The professional-grade kitchen is paired with broad water vistas and features center island, quartz surfaces, stainless steel appliances, double sinks, and gas cooktop. Dine in the eat-in kitchen, covered outdoor lanai, or formal dining room with tray ceiling, chandelier, and stylish d 233;cor for any festive occasion. An office features cherry wood built-ins. The master suite embodies coastal elegance with built-in entertainment center, fireplace, and spacious master bath with soaking tub, walk-in shower, dual vanities, and high ceilings. Three additional bedroom suites provide privacy for all while an upstairs bonus room adds to the private spaces. Hurricane compliant construction brings peace of mind. A wealth of outdoor rooms, including summer kitchen, covered lanai, sundeck, porches, and terraces embrace the Florida lifestyle. Relax in the sparkling pool and spa. A dock with lift accommodates larger watercrafts and open miles of sparkling waterways. Private beach access for spectacular sunsets! 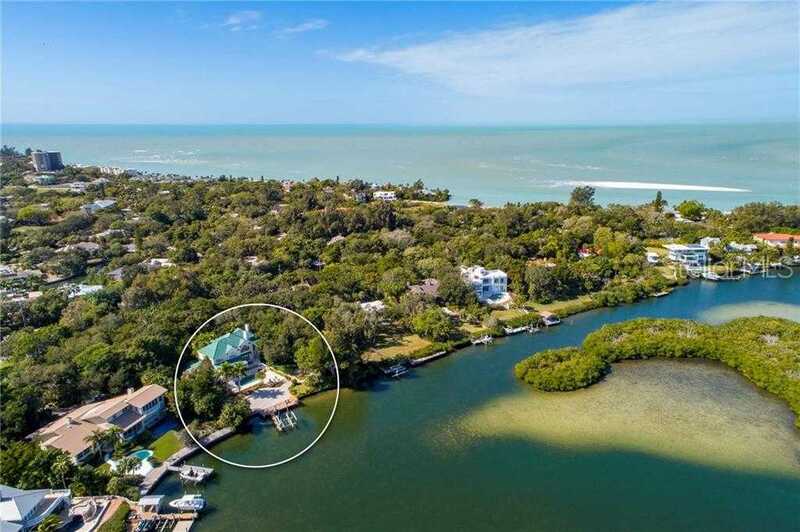 Please, send me more information on this property: MLS# A4425944 – $4,495,000 – 711 Mangrove Point Rd, Sarasota, FL 34242.